If I had the option to design my own room while growing up, I would’ve probably centered it around Ariel’s aquatic castle, an underwater theme rich in blue patterns and a ceiling mural that mimicked the ripples of water. 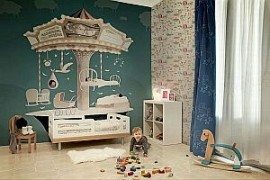 That was my dream room, and I’m sure your children have secret wishes of their own! Instead of guessing which decor or theme is their favorite, read today’s post with your little ones to pick out a special bed that’s anything but common. Awhile back we covered nursery cribs and bunk beds, so I thought I’d follow along the unique trend and show you why round and rectangular beds just don’t cut it anymore. 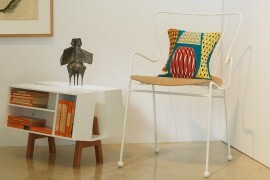 Before we get too far ahead of ourselves, let’s look at a couple of simple bed creations that combine conventionality and originality. 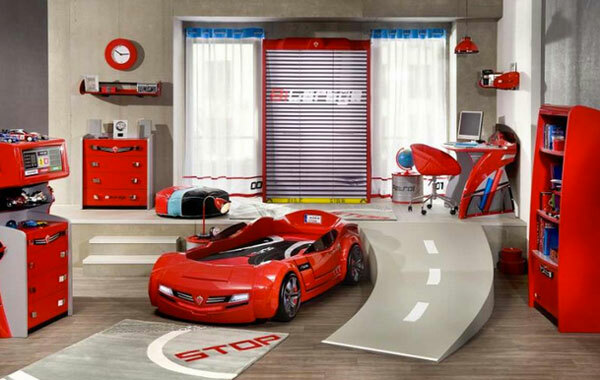 If you are not yet ready to make the leap for daring bed designs, your kids would love rooms that embody a central theme just as much. 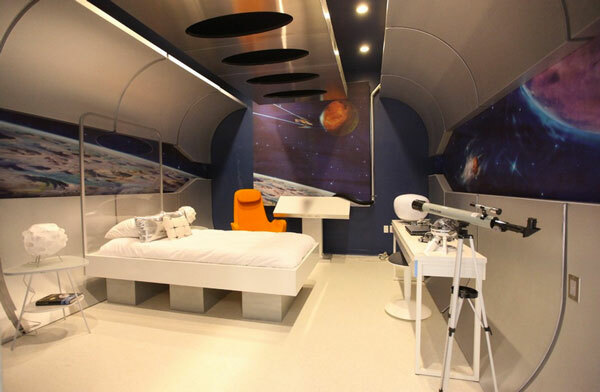 by Bayless Custom House Inc.
A spaceship room with a telescope is by far one of the coolest bedroom ideas I’ve seen yet! A bed that looks as if it were taken from NASA headquarters will definitely be a treat for a little boy who dreams of one day becoming an astronaut himself. When your kids ask you to buy them a Batmobile for their birthday, you can meet their requests with a bed like the one below. 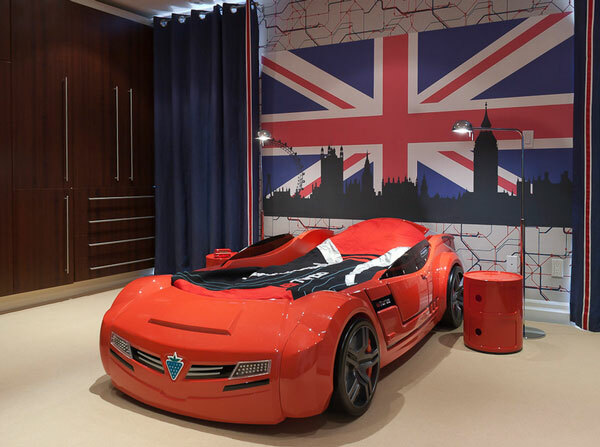 Modeled after the real deal, this onyx bed is the top choice for any little boy who wants to fight crime in Gotham. Even Batman himself can’t say otherwise! 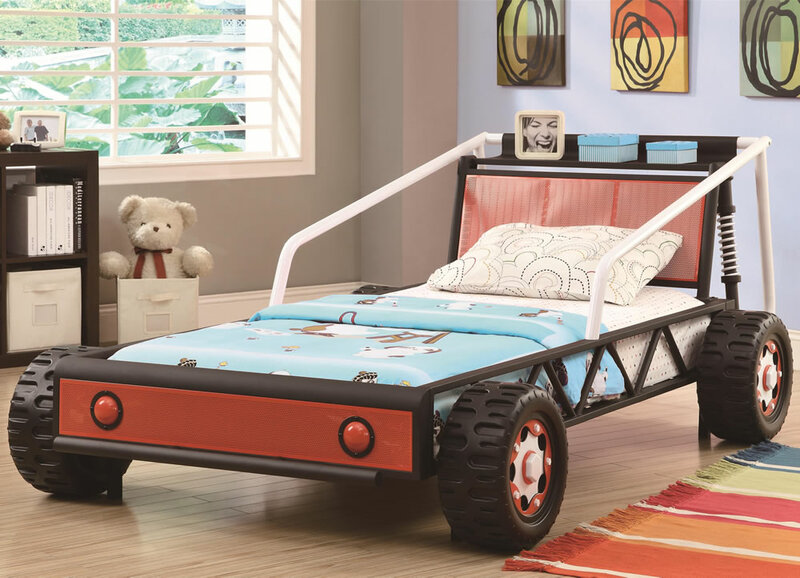 This dirt car bed will be a fun addition to any child’s room. 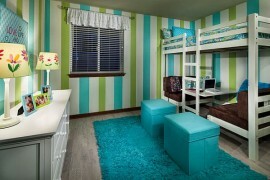 Comfortable and spacious, the bed is just the right size for a growing child with a hunger for action-sports. 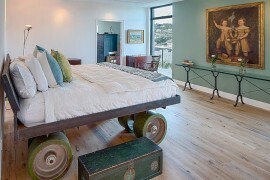 Not to mention, the wheels on the bed give it an extra wow factor. 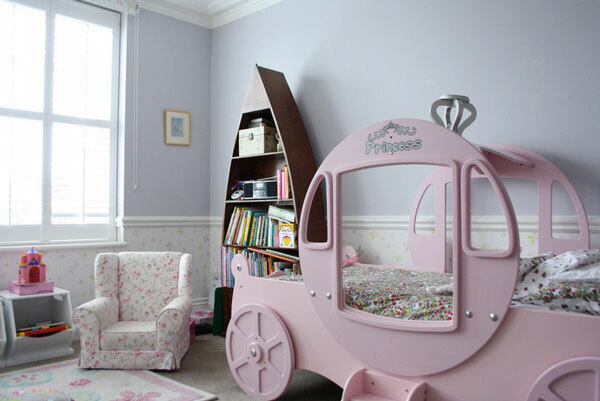 I’m almost certain your girls won’t appreciate a race car bed, but how about a charming horse-drawn carriage bed to suit her royal highness’ needs? 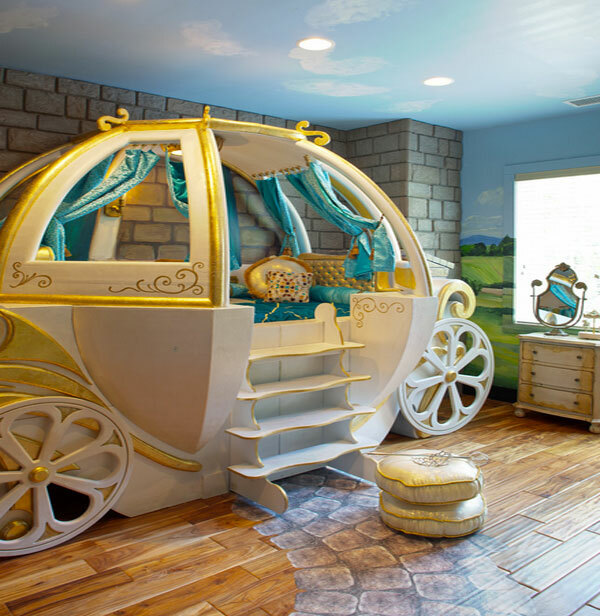 While it might not be Cinderella’s magical carriage, this regal bed is sure to be the work of the Fairy Godmother as well. If you want something less extravagant and a bit more suitable for modern decor, perhaps a cut-out carriage bed will catch your creative eye. The pink wooden bed above can be accessed from all sides, allowing your little princess to play and roll around in abundant space. CHOO CHOO! Hop onto the Slumber Express, because the next stop is Dreamland! 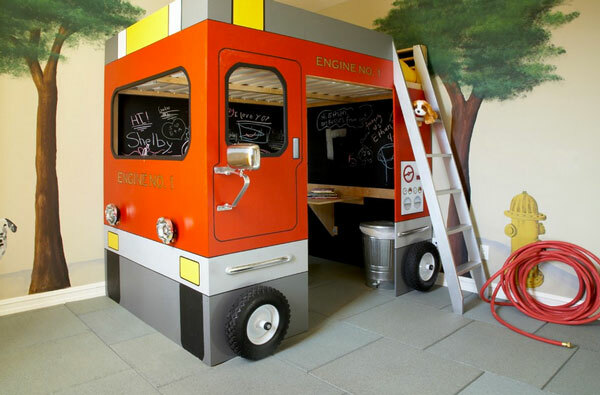 You can’t get any fancier than a locomotive bed for your kids. Embedded into the wall, this box-cart deserves some serious attention, especially with its regal velveteen curtains and classic, aristocratic design that’s detailed to the pin. Flying on a magic carpet can be tiring, but sleep time in this magnificent Arabian Desert oasis retreat will be sweet. Featuring a golden bed crafted to perfection, the room below brings together all the things that captivate little dreamers. Before magical carriages took the scene, there were wagons and wheel barrels. Uncharacteristic as they may sound, these rustic countryside carts make the best beds, as they are both comfortable and homely. Hot Wheels On The Move! Can you say Vroom Vroom? 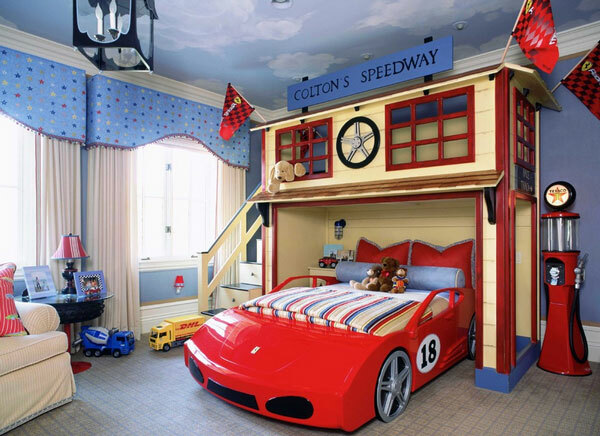 Race car beds are hot, stylish and fast-moving, all features little boys love to see. 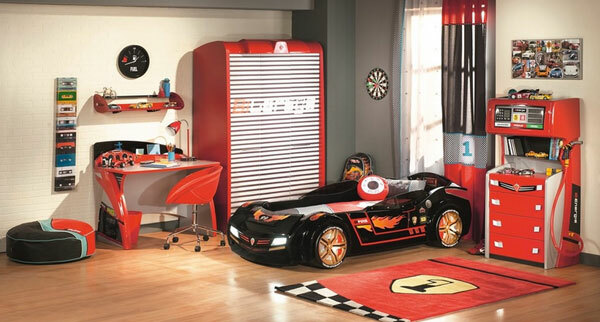 If your kids love race cars, maybe it’s time to remodel their rooms with some wheels, fuel and metal scraps. 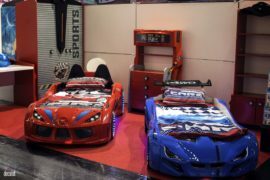 Tell me which race car bed you like the most!